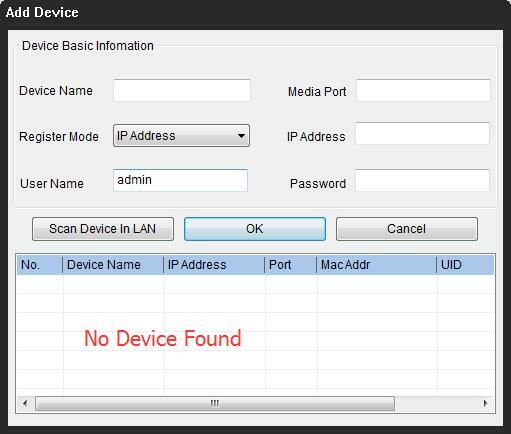 If you found no device in the device list when scanning device in LAN to add Reolink cameras or NVRs to Reolink Client, please follow the steps below for a simple troubleshoot. Cause 1. The device is not powered on. Note: How to tell if the camera is powered on? Turn off the lights or place the camera under dark environment, if the infrared lights of the camera turn on, then the camera is powered on properly. Solution: Try to power the device by charging the battery or checking the connection of camera accessories and scan again. Cause 2. The device is not connected to the internet. Solution: Log in to your router to see whether your device is connected to the internet. See how to check it in NETGEAR. If you cannot find your device, please check the internet connection and try to scan again. Solution: Turn off the firewall and anti-virus software (e.g. Norton Security) and scan again. Cause 4. The client is not working properly. Solution: Try to access your device via web browsers. If you succeed, it means the client is not working properly. Please completely uninstall (delete all the settings) then reinstall Reolink Client to different path and try to scan again.